New Signature three bedroom and three bathroom home on the 5th fairway of Big Meadow Golf Course. This home is equipped all the comforts of home, AC, free WIFI, surround sound, and a TV in each bedroom. Located in the Golf Home section you are a short bike ride from our secluded Paulina Pool and the new Lakeside Development. Golf Home 091 is also a short drive to the Glaze Meadow Golf Course, 5 swimming pools, fitness centers, and the award winning Lodge Restaurant. Golf Home 091 is a luxurious home with the perfects makings for a getaway at the Ranch. As guests enter the home they are greeted with a bright and open kitchen that flows in the dining and livingroom area. The flooring is a mix of hardwoods, tile and carpet, the ceilings are vaulted, and large windows bring the outdoor feel into the space. The living room is furnished with a couch and loveseat, coffee table, bistro table with 2 chairs in the corner with lots of light for a puzzle or fun game of cards, gas fireplace, and alarge flat screen TV that is hooked up to the surround sound and entertainment center for easy access to your music on a phone or ipod. Wi fi is free and available throughout the home. Just off the living room is a dining room table seating six guests, and sccess to the BBQ grill and deck are just off the dining room area. The kitchen is spacious; stone countertops, matching appliances, and fully stocked with cookware and service items. Just down the hall from the kitchen is the first bedroom with a queen and flat screen TV, laundry room with full size washer and dryer, three quarter size hallway bathroom and entrance to the garage, which guests have access too. Also on the main floor is the first master suite, furnished with: queen size bed, two end tables with good bedside lighting, large flat screen TV, full size bathroom, and direct access to the deck. 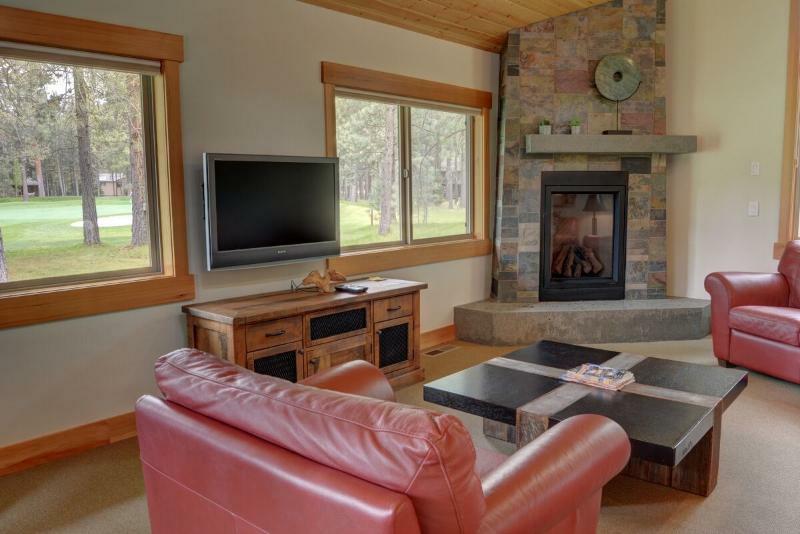 Moving upstairs you will find the main master king bedroom with 2 cozy reading chairs, private gas fireplace, large flat screen TV, upstairs balcony that connects to the deck, and a large master bath, shower, and double vanity sink.